The 2013 What’s Out There® Weekend season was capped by events in the Los Angeles area. On October 26th and 27th TCLF offered several dozen free tours of significant landscapes in LA, Pasadena, and Santa Monica, with sites ranging from iconic downtown Modern and Postmodern plazas, to magnificent Beaux Arts spaces with Mediterranean flair, to botanical gardens and even a walk through the woods surprisingly close to Hollywood. Ken Smith, Lisa Gimmy and Howard Rosen, photo by Kelly ComrasThe Weekend kicked off with a lively opening reception at Room & Board in the historic Helms Bakery Building in Culver City, the fourth such event hosted by Room & Board. Tour guides and volunteers, partners and sponsors, and tour participants mixed and mingled, sampling a range of delicious organic wines from Frey Vineyards. TCLFBoard and Stewardship Council Members from the area – including Carolyn Bennett, Kelly Comras, Lisa Gimmy, Steven Keylon, and Noel Vernon – showed their support at the party and expertise on tours throughout the Weekend. by Dan Garness and Ann Scheid (at the Pasadena Civic Center). Saturday’s Getty Center tour, another Weekend highlight, was led by Dennis McGlade (a principal at OLIN and TCLF Board Member), and Getty Grounds Supervisor Michael DeHart. The tour meandered from the museum’s welcome courtyard throughout the gardens and down to the sculpture garden, with first-person anecdotes about what really goes into maintaining this showplace (hint: there are cranes for big trees and year-round plant swapping programs). Sunday offered a back-to-back powerhouse experience of downtown LA, with a morning tour of the Civic Center and afternoon exploration of Union Station. 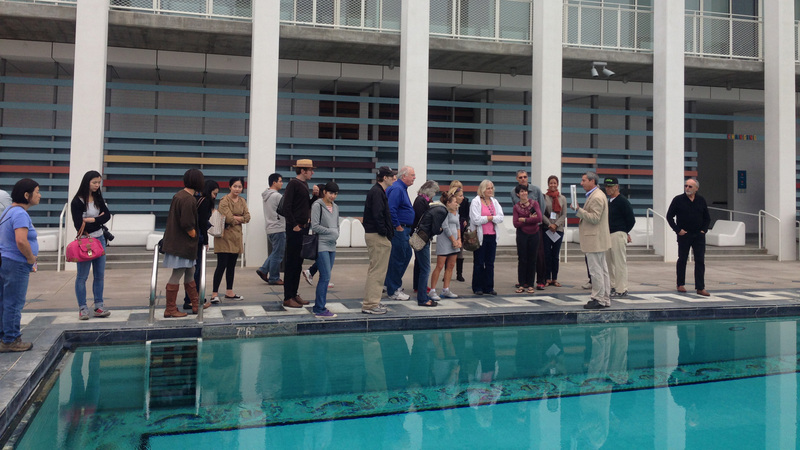 These two tours, led by Steven Keylon (a TCLFStewardship Council Member), Holly Kane, Andrea Thabet, and Tony Paradowski and Jessa Chisari from the firm Rios Clementi Hale Studios, connected the city’s Modernist Civic Center from the Music Center to Grand Park with Union Station’s historic and restored landscape. Ferndell in Griffith Park, photo by Sonia Brenner.Sunday’s tour of the Stuart Building presented a rare glimpse into a marvelous collaboration between Edward Durell Stone and Thomas Church, and a great example of successful adaptive reuse. Designed between 1956 and 1958 as the headquarters for Stuart Pharmaceutical (creators of the capsule pill, among other things), the building and grounds have been carefully restored for use as a leasing office and meeting space. Robert Chattel’s excellent tour brought us from the entrance portico with a classic Stone screen wall through the building and out to Church’s oval swimming pool and spray fountains, once an amenity for employees. The weather was great, just a little fog each morning but no rain (of course, it’s LA! ), and Angelenos came out in force. As one local told us: “I just want to let you know how very impressed I was with your tours…This is too good to be missed." What's Out There Weekend Los Angeles was made possible by the generous support of Presenting Sponsor Coldspring; and Partners Park West Companies, Valley Crest, Monrovia, Van Atta Associates,Historic Resources group, The Los Angeles Conservancy; Room & Board, the Santa Monica Conservancy, and the Southern California Chapter of the American Society of Landscape Architects. Thanks also to our many sites, partners, and supporters who helped spread the word, and local media who covered the events. Please refer to theWhat’s Out There Los Angeles Web site for a complete list of sites and sponsors and the publications page to purchase a What’s Out There Los Angeles guidebook. Plans are in the works for What’s Out There Weekends in 2014, with tentative dates for April in Miami and October for Richmond, VA and Newport, RI. Stay tuned for more details as well as a possible Los Angeles follow-up in 2014!